var brightcoveBrandsafety='' The Lakers face a testing next few months despite not even being in action during the playoffs.Magic Johnson resigned from his post as Lakers president while Luke Walton also lost his job as head coach.And they will need to act fast to find replacements with the NBA draft coming up. But arguably more important for the Lakers is the upcoming free agency market. Related articles Joel Embiid injury: Sports doc gives DEVASTATING update on 76ers star Joel Embiid INJURED: Philadelphia 76ers knocks bad knee in Nets clash A host of the NBA's best players could potentially be available for the Lakers, who have created enough cap space for one max salary slot. Kevin Durant and Leonard headline the free agency market, the latter of which the Lakers tried to trade for last summer.Ultimately, the San Antonio Spurs refused to do business with the Lakers back then, but reports at the time suggested Leonard still had Los Angeles in mind for free agency in 2019.The LA Clippers are also heavily linked with recruiting Leonard and have sent scouts to watch him regularly at the Toronto Raptors this season. 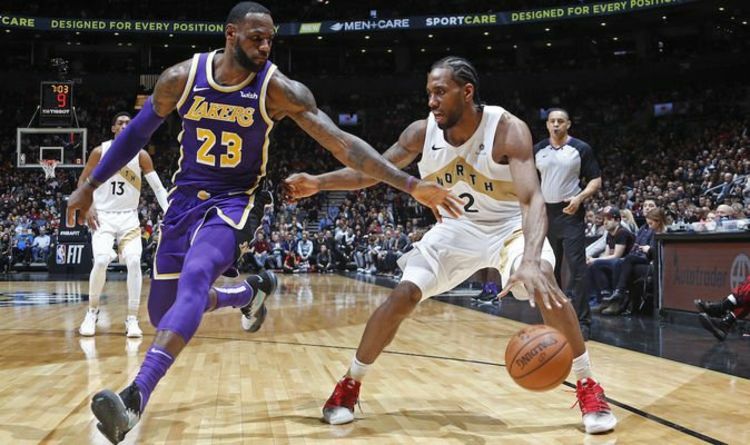 Kawhi Leonard has been heavily linked with joining the Lakers (Image: GETTY) Related articles NBA news: Warriors GM Bob Myers LAUGHS off Lakers rumours Zion Williamson officially declares for 2019 NBA Draft Kawhi Leonard was picked by LeBron James in the All-Star game (Image: GETTY)But the Lakers will be hopeful the lure of playing alongside LeBron James will be enough to win the battle for his signature. And Lakers fans got excited about their chances of signing Leonard following comments from Bryant.Bryant, tweeting about the latest episode of DETAIL on ESPN+, tweeted about the "phenomenal progress" Leonard has made since entering the league.And Lakers fans immediately took that as a sign the five-time NBA champion was trying to recruit Leonard to the Staples Center. Related articles LeBron James BLAMED for Lakers crisis as Luke Walton offered new job NBA trade news: LeBron James and Anthony Davis backed to join Celtics Kobe Bryant got Laker fans excited with his tweet about Kawhi Leonard (Image: GETTY)One fan tweeted: "Recruit him. "Another posted: "Kobe already doing presidential work for the Lakers. .A third said: "Lure him to the Lakers.A fourth posted: "Recruit than man Kobe #lakershow. "..